THERE IS A NON-SURGICAL, non-invasive volume restoration or facelift alternative that requires no downtime and that is perfect for patients who do not want to undergo surgery or for whom surgical facelift procedures are contraindicated. This protocol involves hyaluronic acid injections using a cannula inserted into a single point on the side of the face. It is used to elevate sagging tissue by restoring the bone and fat volumes lost through ageing. Developed and standardised by Dr Sandrine Sebban, the STOP Facial Ageing Method™ establishes a rigorous procedure to address volumetry as well as the interrelationship between different treatment areas. A revolutionary innovation that, presented primarily to treat women’s faces, is also accessible to men according to specific modalities adapted to their morphotype. 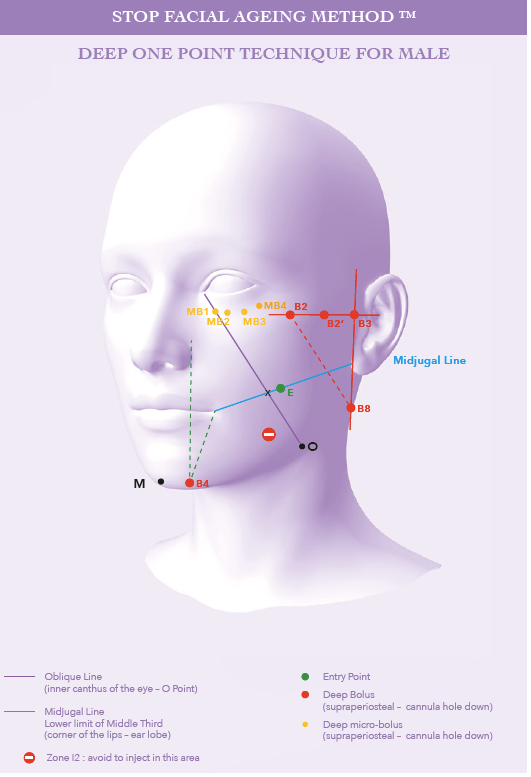 The STOP Facial Ageing Method™ protocol combines two complementary techniques— Deep One Point (DOP) and Superficial One Point (SOP)—promoting masculinization and/ or rejuvenation by restoration of the volumes of the face., depending on the patient, with very natural, comprehensive results. The DOP technique works on the deep plane and thus allows relief to the bone architecture of the male face by highlighting the shape of the jaw with the projection of the mandibular angle, the orbitomalar and zygomatic zone. The deep injection of the chin area allows the injector to accentuate, if necessary, the width or the length of the chin. The SOP technique acts on the subcutaneous or superficial hypodermic planes to create or restore the volumes of the face while bringing optimal hydration of the tissues. 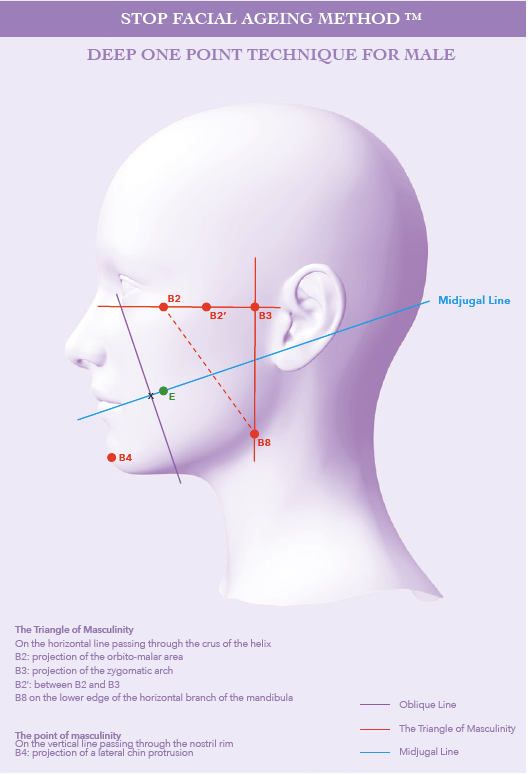 The Midjugal Line to precisely locate the single entry point (Figure 2). The STOP Facial Ageing Method™ uses a patented “pilot” needle known as the SoftFil® EasyGuide. This needle enables the practitioner to gently create a pre-hole puncture and insert the cannula in a single gesture, making the process effortless for the practitioner and virtually painless for the patient. The needle’s innovative ergonomics, V-shape, and lateral double grips ensure stability and offer the practitioner an excellent view of the injection site. The needle’s cut and open axis allow the practitioner to position the cannula with precision and then gently guide it to the desired depth and location for tissue injection. The STOP Facial Ageing Method™ involves hyaluronic acid injections using a cannula inserted into a single point on the side of the face. The non-surgical facelift protocol is conducted in a physician’s office and consists of three successive steps corresponding to the three treatment phases—one DOP phase and two SOP phases. 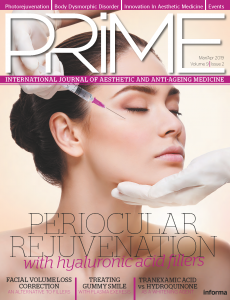 Each of these phases involves cutting-edge hyaluronic acid injections, the specific properties of which are perfectly adapted to the various regions to be treated. B2’–B3: projection of the zygomatic arch. 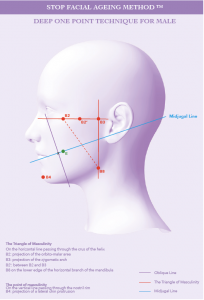 B8: projection of the angle of the jaw. B7 (at the anterior edge of the masseter). A 25G to 27G cannula is introduced into the superficial fat and nappage is applied in a ‘fanned’ pattern to the middle and lower thirds of the face, avoiding the sub-orbital region and jowl area. You can also restore the volume of the lips or increase it harmoniously, taking care to always keep a volume suitable for a male face. To respect facial dynamics, a hyaluronic acid with good elasticity is chosen. Results: volumes are restored, superficial wrinkles are smoothed, and a remarkable lifting/firming effect is achieved through reharmonisation of the skin’s surface. Using a 27G cannula and hyaluronic acid with little or no crosslinking, a sub-cutaneous nappage is applied in a ‘fanned’ pattern to the middle and lower thirds of the face. The suborbital region is avoided and, if necessary, the upper perioral area and bitterness folds (puppet wrinkles) are intensively treated. Results: the face is hydrated and radiant, wrinkles and fine lines are filled. 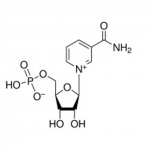 The method’s protocol is standardised and reproducible. Treatment is fast (less than one hour). The procedure is virtually painless, is compatible with an active lifestyle, and involves minimal side effects. Results are instantaneous and last 15-18 months, depending on the hyaluronic acids used.